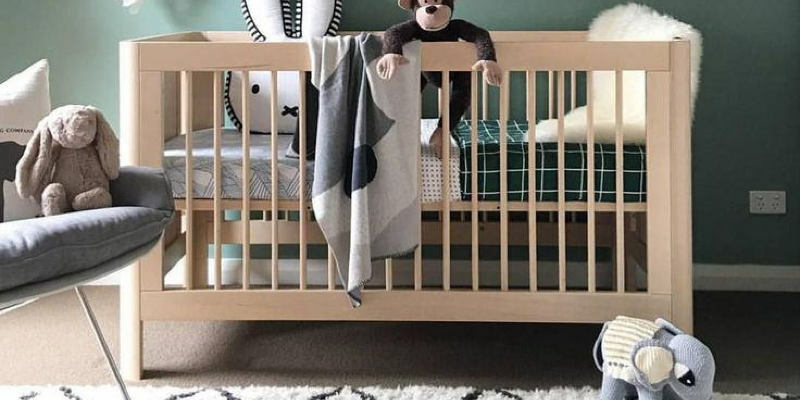 When Sandy and Aaron Flores hired designer Jennifer Bishop to turn an everyday bedroom into a nursery school, the goal was a gender-neutral space that would work for their second kid — and the next one after that. Pregnant with her second child and hoping to get a third down the street, Sandy did not wish to go through the potential hassle of creating an entirely new space twice. So Bishop made this “modern forest,” complete with kelly green walls, tree trunk decals and owl accessories. This piece of art by Avalisa from Art.com motivated the nursery’s colour palette. “The colors were just so beautiful to me, and also the quilt layout proved to be a fantastic way to present a typical baby thing in a contemporary and lively manner,” says Bishop. Polka-dot upholstery on the glider is playful without being too juvenile. For each room she decorates, Bishop attempts to make a minumum of one accessory, such as this throw pillow topped with sensed buttons. “I love giving them special, unique pieces,” she states. Bishop admits that the kelly green paint colour was a small risk. Happily, due to the room’s abundance of natural lighting, the colour worked. “When it comes to specific daring colors, you really need a lot of natural light to bring out their true beauty,” she states. 2 IKEA Billy Bookshelves with an Ekby centerpiece provide the space . This stuffed dog is out of World Market, however, Bishop suggests scouring Pier 1 or 2 Etsy for endless options of unique stuffed creatures. “For something different, look for those made with materials like patterned cloths or a tight knit,” she says. Bishop created playful silhouettes by outfitting the wall with stickers. Her program tips: Before applying stickers, make sure that your paint is cured. Once you’ve peeled off the backing and stuck the stickers to the wall, then help it stick by rolling out a rubber roller across the decal whereas the front paper is still attached. Then, slowly peel the off paper and then use the rubber roller to smooth out any air bubbles. Sandy requested Bishop to include a location where she would hang the baby’s hats. Rather than using pegs or hooks, Bishop opted for a birdcage stand from Urban Outfitters to add a small unexpected fun. Finished in red, it provides a complementary contrast to the green wall.